In another U-turn of the saffron brigade, the BJP on Sunday decided to field Rikman G Momin as its candidate in Tura Lok Sabha seat against the two-time parliamentarian and former Union Minister Agatha K Sangma. Earlier on Saturday, the BJP had announced to lend its support to Agatha, the National People’s Party (NPP) candidate in Tura for parliamentary election. On Saturday, state BJP president Shibun Lyngdoh had made a formal announcement before the media that his party has ‘decided to support the NPP candidate in Tura parliamentary constituency since the party leadership has decided not to field a candidate’. Lyngdoh’s statement came after the BJP Central Election Committee on Saturday announced the name of sitting BJP legislator, Sanbor Shullai as its candidate for Shillong Parliamentary constituency. However, BJP spokesperson Nalin Kohli expressed ignorance of Lyngdoh’s statement. He added in the party only the central election committee takes a final call on whether to contest a seat or not and also when a seat is to be announced. With the Bharatiya Janata Party (BJP) declaring its candidate, Tura will now witness a triangular contest with former chief minister and present leader of the Opposition in Meghalaya Assembly, Mukul Sangma of the Congress in the third corner. 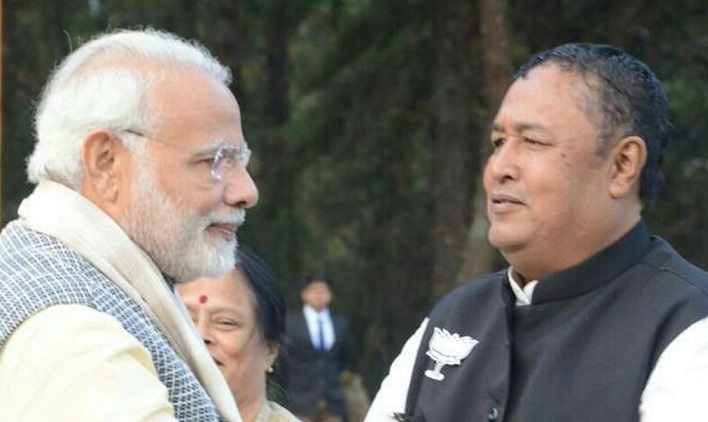 Momin, had unsuccessfully contested the 2018 Meghalaya Assembly elections from Rongjeng constituency, had come a distant seventh, polling 1,474 votes. She is being also backed by the People’s Democratic Front, the Hill State People’s Democratic Party, and Nationalist Congress Party which are also part of the ruling coalition. However, the saffron party, which is also part of the coalition, had decided to contest both the state’s two constituencies on its own. The Garo National Council which does not have member in the 60-member Meghalaya Assembly has also extended its support to Sangma.